No one knows better than Alex and Donna Voutsinas that it's a small world after all. 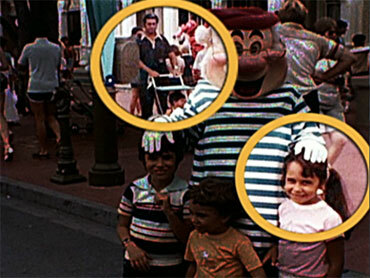 A few days before their wedding they were astonished to find a 1980 family photo of little Donna at Walt Disney World -- and incredibly little Alex in a stroller being pushed by his dad in the background. On "The Early Show" Alex and Donna Voutsinas appeared on the broadcast from where it all began -- Disney World. Alex said the couple found the photo at Donna's parents' house. He explained, "We were going through old family pictures looking for baby pictures of us for our wedding album and our video. And my wife pulled the picture out of her and her brothers at Disney World. Right away, I just -- the background caught my eye, it was my dad. Pushing me if a stroller. It just blew my mind. I couldn't believe what I was looking at." Alex said he picked his dad out of the crowd because of his jet black hair with a big white tuft at the top. Alex said, "I saw that right away. I said, 'Oh, my god, honey, this is my dad.'" Donna said learning of the photo a week before her wedding made her freak out. "It gave me chills and it still does to this day," she said. Alex was born in Canada. Donna is from Florida. The couple officially met 14 years later when Donna started working at Alex's family-owned hotel. They started dating in 1994. Alex and Donna went to Disney World several times on dates. "We went a lot," Alex said. "A lot when we first started dating, we used to come a couple times a year, never knowing that picture existed." He added, "When I tell people the story, it gives me goose bumps. I always knew it was meant to be, and this is just the icing on the cake." The couple now have three sons, ages 1, 3 and 6. Donna said they've told their kids about the picture, but she isn't sure they understand the significance just yet. Alex says he and Donna look at photos differently now. He explained, "I'm a detail-oriented guy anyways, and I usually look at the whole thing, but now we make jokes when we take our kids to Disney, I say, 'There's our future kids' wives.'" The couple has known about the photo for eight years, but only recently did they post it on Facebook for the world to see. The response was instantaneous. Alex said, "Recently as friends were pushing us, you have to tell this story, it's unbelievable. We put it on Facebook about two weeks ago and the story just exploded. We got contacted by news stations, by everybody." As for their Disney connection, Alex and Donna said it's not out of the question that they could renew their vows on their 10-year anniversary at the theme park. Donna said, "Anything's a possibility."